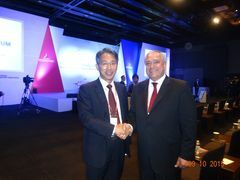 During ASEM Symposium on Eurasia Transport and Logistics Network, held in Seoul 9-11th September 2015 Mr. Chang Woon Lee, President of Korea Transport Institute and Mr. Mircea Ciopraga, Secretary General of the PS IGC TRACECA discussed the problems and obstacles along international transport corridor TRACECA. Mr. Ciopraga informed Mr. Lee that TRACECA always attracts key long-term and short-term experts for monitoring and analysis for better assessment of current situation on the corridor within the implementation TRACECA projects. On the outcomes and research made by each TRACECA projects, there is an opportunity to forecast and to follow the effectiveness of the realization of step-by-step strategy in the field of maritime, road, and air transport. Mr. Lee and Mr. Ciopraga underlined the importance of sharing experience, taking into consideration possibilities and knowledge provide by Korea Transport Institute. It should be noted that the Korea Transport Institute (KOTI) is an official research agency for the government of the Republic of Korea. The mission of KOTI is to provide recommendations and alternatives for the nation`s transport policy and to create the optimal transport system through specialized research and technical innovations, while positioning itself as one of the world`s leading transport research institutions.